Bespoke suits are the highest achievement, to date, of a very old art form – Tailoring. 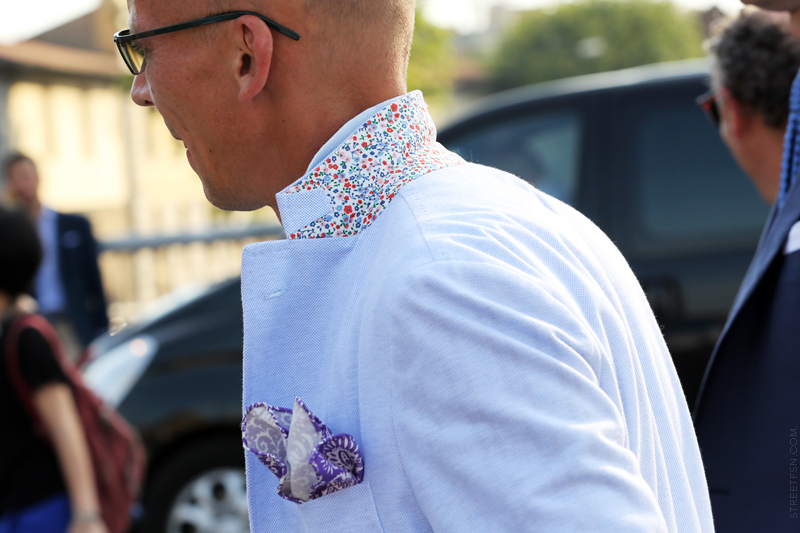 There’s a lot of detail to get your head around when thinking suits. But fear not Gents, this series will shed some light on what you need to know about suits. Regular readers will no doubt be shouting (inappropriately, in public) ‘HERESY!! !’, knowing just how opposed I am to any sort of fashion rule. Or life rule for that matter. However, if you want to communicate effectively to those around you, it helps knowing some basics of how your suit should fit. This is particularly handy when shopping for off-the-peg suits, as some details can be altered by a tailor to your taste/body, other not. When staring at your potential purchase in the fitting mirror keep in mind that the most important aspect is how it makes you feel, and how it moves with your body. Then start with the collar and work your way down. 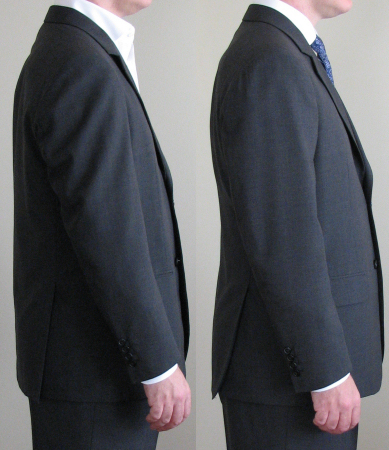 1 – Collar: You’re looking for a smooth fit between the collar of your jacket and the collar of your shirt. Too tight will pull the lapel out of shape when you button up, too loose will leave an unsightly gap at the neck and make it sag over your shoulders. If you HAVE to buy an incorrectly fitting collar, then opt for larger, though you’ll have a hard time finding a tailor to tackle this alteration for any sum of money; it’s a massive ball ache. And if you’ve had insufficient foresight to wear a dress shirt on your suit shopping expedition, ask the store for one! It’s important! Alternately make sure you can run a finger round the back of your neck beneath the collar comfortably and hope for the best. 2 – Shoulder: This is also one of those difficult-to-alter sections, so try and get a good fit here from the beginning. It should feel as if the shoulder terminates exactly on the bone of your shoulder, and look as if it terminates about 2cm beyond this point. What you’re really looking for is a straight line from your neck to the sleeve; if there’s a sudden slope or some puckering, it’s a bad fit. Make a point of moving your arm around (it’s the part of your body that moves the most) to ensure that it’s comfortable. Arm movements should also not destroy the suit’s silhouette: if raising your arm to give someone a hi-five (do people still do this?) pulls the side of the jacket up and away from the body, you’ve got a bad fit. A common problem I’ve seen with suits off the peg is that gents need to fit their mid-region, and so have to opt for a larger suit, resulting in terribly (I mean HIDEOUSLY) ill-fitting necklines and shoulders. This is mainly the result of poor pattern grading, but I’m afraid not a problem easily sidestepped in mass production. 3 – Waist: Ideally you’re wanting the suit to taper slightly at the waist, even (especially) if your natural waistline doesn’t. A good quality suit should give at least the illusion of a smaller waist than shoulders, helping you achieve that coveted Adonis physique. This is the hardest thing to get right if your mid-section is a bit robust, and honestly I’ve never seen it done well in an off-the-peg suit. If you insist on supporting the mass production industry, then get a good fit round your middle and go door to door begging tailors to tackle the shoulder and neck line alteration. But prepare to pay. 4 – Sleeves: Here again I’ll encourage you to move your arms around and see what you’re comfortable with. Ideally you want a reasonably loose fitting sleeve that doesn’t look baggy, which terminates (traditionally) as it touches the outer wrist bone. The trend in warmer climates of wearing your suit with a short sleeved shirt may be influential here, or it may just be the modern way: Most of my clients have their sleeves terminate just above the first bone of the thumb, where a long sleeved shirt’s cuff would usually sit. And I’m seeing longer sleeves almost everywhere I look, so again, whatever makes you feel comfortable. 5 – Lapel: Depending on your taste make sure you’re happy with the overall look of the lapel. Some off-the-peg lapels can be altered at the notch, others not (look underneath the lapel for a postage stamp-sized fold of fabric, which can be adjusted quite easily). In general larger men look better with wider lapels (according to a certain International Fashion Icon I know), and thinner labels are supposed to be more modern. The central aim of the lapel is really to give the Adonis illusion of broad shoulders and a thin waist, so keep this in mind when admiring yourself in the mirror. Also check that the lapel lies flat without puckers when buttoned up, as adjustments here are near to impossible. 6 – Jacket Length: Will obviously be according to your taste, but the rule is to have it terminate at the last joint of your thumb when your arm is at rest. Most of my clients have their jackets a bit shorter (again the climate may be involved here), terminating around the same place as the sleeve. Also check that the hem of the jacket looks parallel to the floor when standing easy. This requires it to be cut unevenly (it’s difficult to explain, just trust me) and some off-the-peg suits save patterning costs by cutting this section straight, making it look higher in the front when worn.